Appointed executive head chef of Holborn Dining Room in 2014, Calum Franklin combines traditional cooking techniques with clever flavour combinations to create a comforting yet contemporary British menu. Beginning his career at Michelin-starred Chapter One in Kent, it was here that Calum learned and refined the fundamentals of cooking. He then continued his training at The Ivy, Aurora at the Andaz Hotel and Indigo at One Aldwych Hotel. Calum then moved to Borough Market favourite, Roast, where he spent two years climbing the ranks. 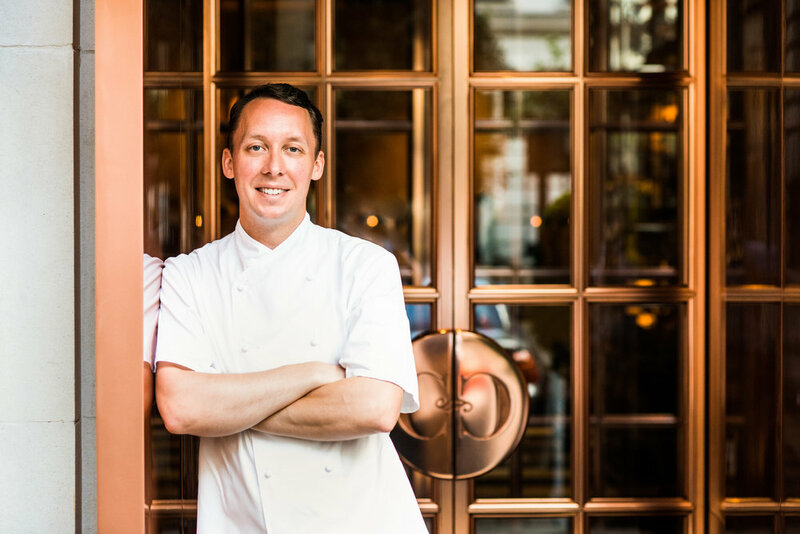 With his culinary credentials firmly focused on British cuisine, Calum joined Rosewood London as head chef at the hotel’s Martin Brudunizki-designed brasserie, Holborn Dining Room. Embracing old school techniques, Calum aims to revive the ‘craftsmanship’ of cooking. Unfazed by the latest cooking fads, he favours investing time into each dish, and prefers the original processes when creating classic dishes. A labour of love, Holborn Dining Room’s Beef Wellington takes three days to prepare the old-fashioned way. A signature of the restaurant, the dish is available one day a week, on ‘Welly Wednesdays’. Calum’s additional signature dishes include the award-winning Monkshill Farm scotch egg, shrimp burger and his duck, pork & pistachio en croûte, which involves days of preparation. A true champion of British produce, Calum is fastidious when sourcing only the best from the British Isles, wanting diners to be wowed ‘by ingredients as well as cooking’. Many of the restaurant’s seasonal ingredients are from The Cornwall Project. Matt Chatfield, who is also a good friend of Calum, believes Cornwall offers some of the finest meat, fish and vegetables in the world. His suppliers also include Phillip Warren & Sons Butcher, Matt Stevens & Sons Fish and The Modern Salad Grower. Chef Calum’s particular passion, and one which has gained him substantial recent recognition, is his modern take on the classic British pie. His meticulous pastry craftsmanship has secured a feature in 2018’s Observer Food Monthly’s Top 50 most loved things in the food world, and this March, ‘The Pie Room’ at Holborn Dining Room officially opened; a one-stop destination dedicated to one of Britain’s most iconic dishes. Spearheaded by the pastry expert himself, ‘The Pie Room’ at Holborn Dining Room is a treasure trove of savoury delicacies, and somewhere for every food lover to swing by and take away one of the beautifully intricate pastry creations. Initially educated at Durban University of Technology in South Africa, Nokuthula Mbambo, or Nokx as she is known, began her culinary career at the 4-star Riverside Hotel in Durban. Shortly afterwards, she moved to London to take on the role of Demi Chef at the Intercontinental Hotel Park Lane, where she stayed for 2 years. Nokx’s love for working in luxury hotels continued, as she joined The Landmark as Chef de Partie, and over the course of 5 years she honed her craft and worked her way up the ranks, departing as Senior Chef de Partie. After two years working as Senior Chef de Partie at Brown’s Hotel in Mayfair, she joined the team at Rosewood London in May 2014 where she currently works as Sous Chef. Working under the tutelage of Holborn Dining Room’s Executive Head Chef Calum Franklin, Nokx learned the specialist and intricate skills of pastry making, which she continues to do in the recently opened Pie Room within the restaurant. Outside of kitchen parameters, Nokx works closely with Women in Hospitality, an organisation that supports and fosters the career development of women in the hospitality industry. She is particularly passionate about bringing women to the forefront of the chef industry, by encouraging and supporting those starting their careers by organising networking events and workshops. Within Holborn Dining Room, Nokx leads many training sessions for her fellow chefs, acting as a mentor for her colleagues in order to push them to strive for more. Nokx hopes to continue using her position at Rosewood London as a force for change within the hospitality industry, encouraging other women to be ambitious in their goals as chefs and empowering them in the kitchen.